Sleeping Beauty tells the true story of the beloved John as Beauty, the woman disguised as a man, and cut from the Christian story. Once upon a time there lived a King and Queen who longed for a child. They went to all the waters in the world, vows were made, pilgrimages were taken, everything was tried and nothing came of it. At last however the Queen was with child, and some months later, just before the sun peeped over the mountains, a little princess was born. We must have a very special christening, said the queen; and for her god- mothers the princess had all the fairies of the land. The king’s messengers were sent far and wide to deliver the invitations. At last the great day dawned. Even before the lords and ladies began to arrive, the twelve good fairies of the kingdom came gliding through the air. “All the fairies are coming!” cried the queen. But there was a thirteenth fairy… who had not been seen in more than fifty years… who the king and queen did not think to invite. The old fairy fancied that she had been slighted as she crashed the party, muttering wicked threats between her teeth. One of the young fairies, who sat beside her, heard her, and thought she might wish harm on the princess… so the young fairy rose quickly and hid behind the curtains, that she might speak last… and repair as much as she could of the evil the old fairy might do her. “On her sixteenth birthday she will prick her finger on the spindle of a spinning wheel and die!” With a terrible cackle the wicked fairy disappeared. The king and queen knelt in sorrow beside the cradle. “How were we to know of this dreadful thirteenth fairy?” sobbed the queen, whose tears flowed so freely that she soaked the baby’s blankets. At that moment, the twelfth fairy flew up to greet the tiny princess. “I still have a wish for Aurora,” she said. “Because the thirteenth fairy’s power is great, I can not break her spell… but I can soften it.” She waved her wand and raised her voice to declare that “When the princess pricks her finger she will not die, but will sleep for a hundred years, to be awakened by the kiss of true love.” The king was grateful but he took no chances. He ordered that all spinning wheels in the kingdom be burned. The princess grew up to be a lovely young woman. On the day of her sixteenth birthday, when all in the castle were busy preparing for the celebration, Aurora decided to explore one of the castle towers. Up, up she went and at last came to a big door. “Oh yes!” said Aurora excitedly. But as she reached for the spindle she pricked her finger and swooned onto the cot. There on the cot in the tower she slept deeply where she fell. The twelfth good fairy who had been keeping watch now waved her wand about the castle, casting a spell over everyone and everything in it. People and animals fell asleep in the middle of whatever they were doing. The clocks stopped ticking, and time itself seemed to stop in the castle. Outside, within the space of an hour, there grew such a vast number of trees, great and small, along with thorny bushes and brambles, twining one with another, so that neither man nor beast could pass through. All that could be seen of her palace were the very tops of the towers. Eventually even these could no longer be seen within the great thorny forest. With time the castle was gradually forgotten. Sometimes, an old grandfather would tell a tale of the Sleeping Beauty who lay within a thorn covered castle waiting for the kiss of true love. The years rolled by. From time to time, adventurous young men would set out to free the mysterious princess from her sleep. They tried to cut through the thorns, but before long they were forced to turn back. The thorns tore at the poor horses’ legs, and the branches seemed to reach out to trip them. At the end of one hundred years, almost no one remembered the story of the sleeping princess hid deep within the thorny forest. One day a young prince came to a nearby village. As he was talking to the villagers, an old woman asked, “Have you ever known true love, my son?” “No,” said the prince, “But I long to.” You are just the man to wake our Sleeping Beauty!” the old woman cried, and she told the young prince about the legend. He rode off to the thorny forest, feeling sure a great adventure awaited. As it happened, this was the very day of the princess’s sixteenth birthday a hundred years ago. As he entered the forest, the prickly branches became as limp as seaweed, and his horse passed through unharmed. As the prince rode up to the castle, he saw dozens of dogs and horses frozen in sleep. “How curious,” he said to himself. “This must truly be an enchanted place.” He noticed that none of his people could follow him, because the trees closed again as soon as he had passed through them. Inside the great hall he found the king and queen and all the courtiers and servants dozing just where they had fallen asleep so long ago. On and on he went, until at last he opened the door at the top of the tower. There, on a small cot, lay a sleeping princess in the bloom of her youth. 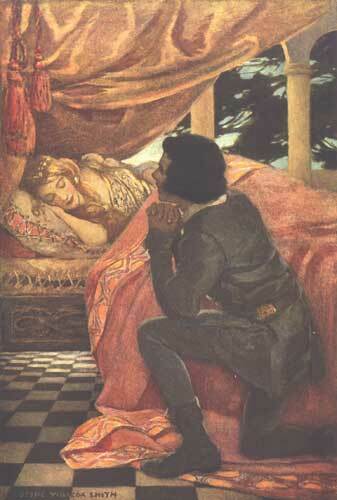 As he gazed on Sleeping Beauty… love entered his heart through his eyes. For he saw before him a luminous spirit of such divine beauty that he trembled, falling to his knees. “This must be true love,” he thought, as he lifted her hand and gently kissed it. At that moment, Princess Aurora opened her eyes and tenderly smiled at him. “Hello,” she said, “I’ve been asleep. Have you waited long?” No words can describe the joy they shared in true love. And though they spoke for hours they did not say half of what they had to say to each other. With wings on their hearts they went down from the tower hand in hand. As they descended the stairs the castle came to life: the king awoke, and the queen, and all the royal attendants, and they looked at one another in amazement. The horses in the courtyard stood up and shook themselves. The hunting dogs jumped and wagged their tails. The doves on the roof pulled their little heads out from beneath their wings, looked around, and flew into the field. “You have broken the wicked fairy’s spell!” cried the king, smiling at the prince. And so the prince and princess, who found true love, lived happily ever after.